This question always sets me back a little because my process, like that of many teachers, is not exactly black and white. I think this is (roughly) how I plan: I obsess about my students constantly, I think about them in the grocery store, on the subway, and making dinner. I think about them as I am falling asleep, and I think about them when I wake up. It is not that I am worrying, persay, its that I am “marinating” in who they are, what they do, what they love and what they need. Simultaneously, I think and read (also somewhat obsessively- if only I could this kind of enthusiasm around cleaning the bathroom) about what makes people active, independent, confident, and successful in the world, not just on report cards. Sometimes, oftentimes in the shower or on the subway, these two thought cycles collide and a big picture goal emerges – and then bit by bit it gets whittled into bite size ideas that fit into squares in a plan book. (Sorry student teachers past and present, it’s not just a Tuesday afternoon thing). Often times (every time) things do not go the way I planned, and so back to the planning boxes to fix up or skip ahead. And yes, I think about the common core state standards, and the benchmarks for learning, and all the other things that make up a curriculum. So After All That, What is My Big Idea RIGHT Now? Truly and honestly, after all this obsessive thinking, I have come to believe its how students meet the standards that really matters. 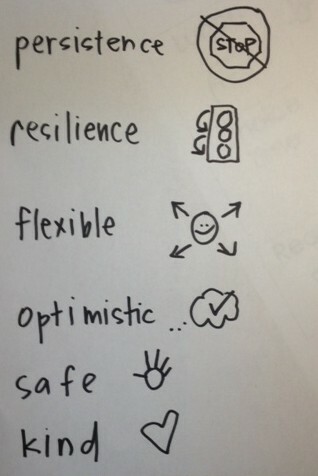 Thinking about the range of children I have worked with over the years, some have been persistent, resilient, optimistic and flexible, others have been rigid, fearful, and passive in their learning. Have both met benchmark? Well yes and no, they may both read on level, but what about the benchmark for having a successful life? If I (metaphorically) scaffold and drag and tug a child to benchmark, have they really made it? What happens to that child in the world? Everything I have been reading supports the idea that persistence, more than IQ, is what makes for success, but few things tell me HOW to fit this big idea onto squares in my plan book. How do I plan to be a gas station, not a tow truck? Two posts ago, I thought of some general guidelines for my teaching this year, last post I began to lay out what I am putting in my planning squares. This week I am continuing that thread- which is the whole purpose of this blog- the real time collision of theory and practice. We did this on a small piece of paper under the document camera. My team originally thought of these symbols to make it easier for kids to code for them in their work and to refer to them, some teachers taught them along with the original read aloud, I waited, for no particular reason other than it felt like a lot happening at once. In teaching simple symbols, children can own a way to indicate the skill without me. In giving them this tool, I am gassing them up, not tugging them. After making this list, my next plan for the symbols is to make a bigger 3 column chart: the word, followed by a picture of the character we studied in read aloud, followed by the symbol. Although kids remembered a few of the symbols, they need the intermediary step of the character since not many of them are reading the word “flexible”. Taught learning plans. I did this first as an activity following morning meeting. First I modeled my thought process of the brain grower(s) I might need for the few parts of the day on the plan, then kids went off to do it while my assistant teacher and I coached into their ideas. This thinker opted to work on being kind during writing (sharing materials, etc), safe at lunch, persistent at choice time, and resilient at reading. You may also note that I provided the symbols for everything but choice time (I have my doodles as a font on my computer- see chartchums.wordpress.com and search for technology to find out how), and this thinker put scissors to remind her that that square is for choice time. The tow truck option here would be to tell children what they need to do in each part of the day, but instead most children set goals for themselves that I tended to agree with and the self selected method feels better to me. Reflected. At the end of each time, I modeled my own thinking of how I met the goal and drew a picture as “evidence”. Let’s be clear, some kids did a little wishful thinking here, but I will take it for now. This thinker wanted to be safe and kind in writing, and her reflection shows that she safely gave an ABC chart to another child. Because some children were wishful in their goal fulfillment sketches, more mid-work breaks are needed to have children self-talk their way through their goals. 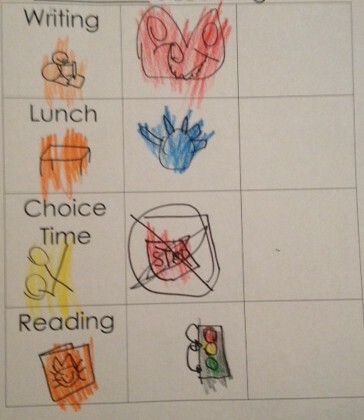 Yes, of course some children filled out the entire reflection side before they actually did the goals. I applaud their ambition, but am teaching them the way the system really works. I let parents in on this for two reasons: this allows a parent and child to have a meaningful conversation about the day. 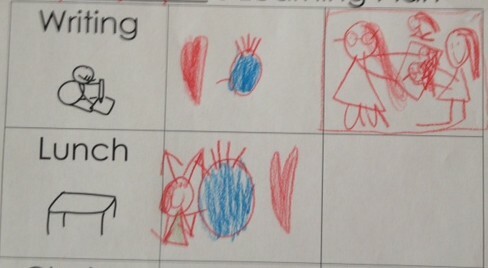 The paper is concrete and I sent the symbols home to the parents so they would know if the child forgot. And two: parents can mimic this at home: what is your goal for your piano practice today? I am worried slightly about the time of all this, as in the first day it took a long time. I get that that it will get faster, I am just being honest. It is incredibly worthwhile, but sometimes EVERYTHING seems worthwhile. Of course, I am dying to know what you are doing to build these skills in your classrooms! Let me know what you think about what we are trying, and what is working for you! I re-visited this post today because I am struggling with empathy, optimism, and persistence with some of my kiddos. I thought the work you did may give me some ideas. I am starting to organize something similar based off of your goal setting with your students. However, I am wondering how it is going in your room. Any new tips/insights? Thanks! It is going really well still! We have focused on self talk and mantras as well and that has been really empowering!